The state of Virginia is very well covered for companies that perform pre-employment background screening with Intelifi. Almost every court in Virginia reports their criminal record data to our national database. There are four Circuit Courts in Virginia that do not provide data to any database – not even to their own state’s Virginia State Judiciary System. Because of this, Intelifi can perform County Criminal Reports in the four Circuit Courts that do not provide their data to the state. The four courts that do not report data are Alexandria County Circuit Court, Fairfax City Circuit Court, Fairfax County Circuit Court, and Henrico County Circuit Court. 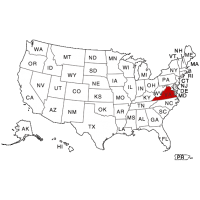 Should your job candidates reside in these counties, we can create a one-step, comprehensive solution for you that checks both nationally and at the county level. This will ensure complete, accurate reports. Virginia reports all Felony and Misdemeanor convictions, ranging from severe crimes such as Sexual Assault, to less serious offenses such as Public Intoxication. Contact Intelifi today to begin comprehensive pre-employment screening in the state of Virginia.